Right-Loop™ provides quick, easy and accurate geothermal loop designs that comply with all industry standards. Based on methods developed by the OSU Design Manual for the general method, ASHRAE Design Manual for fundamental calculations, Cavanaugh/Alabama for lake/pond calculations, and NRECA/OSU/EPRI for Slinky calculations. Right-Loop™ supports multiple single pipe and multi-pipe applications for trenches and wells, and supports a variety of antifreeze options including Propylene Glycol, Methanol, Ethanol and Potassium Acetate (Cryotech GS4 or equivalent). View overview video. 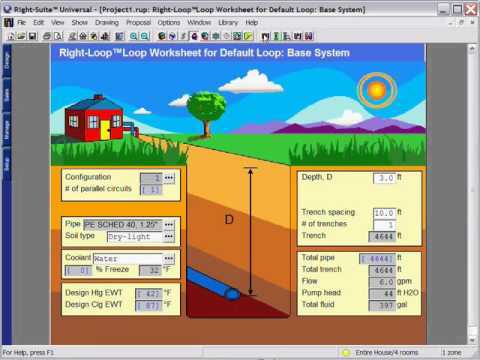 Right-Loop™ is the digital version of the geothermal design worksheet. This program will design your geothermal system instantly, once the data set is completed. Right-Loop™ requires you to set your bin data and earth temperature cities, select your ground-source heat pump equipment and circulating pump, and set your equipment configuration and loop characteristics. (Right-Loop™ contains diffusivity and conductivity numbers for both ASHRAE and EPRI earth types, and supports custom diffusivity and conductivity from soil testing.) Once this is done, the program will do the calculations automatically. Size ground loops for residential geothermal systems. Design the loop to meet the rated capacity or a targeted entering water temperature. See the effects of using different loop lengths. Maintain a customizable Reynolds Number minimum. Utilize a built-in pump sizing worksheet. Computes water and anti-freeze volumes with Reynolds number (and a customized Reynolds number warning) for easy mixing for Propylene Glycol, Methanol, Potassium Acetate (GS4 or equivalent), water, and more. Right-Loop™ is a fast, easy and accurate way to design your geothermal system, without the mental gymnastics of a manual Geothermal Design Worksheet. Right-Loop™ provides quick, easy and accurate geothermal loop designs that comply with all industry standards. Based on methods developed by the OSU Design Manual for the general method, ASHRAE Design Manual for fundamental calculations, Cavanaugh/Alabama for lake/pond calculations, and NRECA/OSU/EPRI for Slinky calculations.